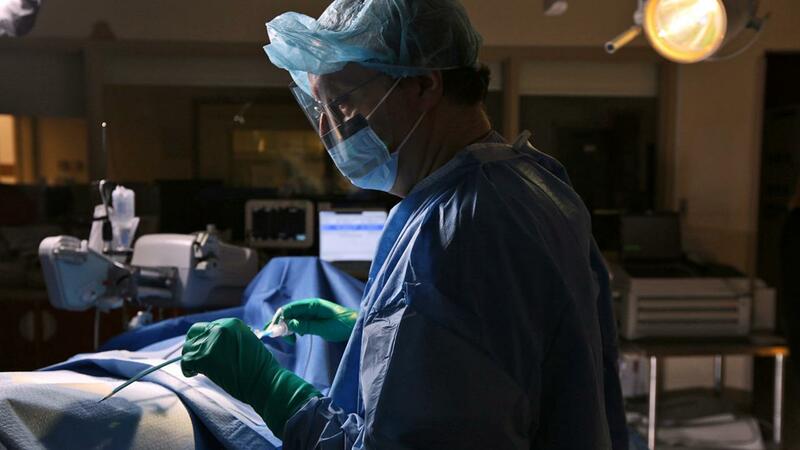 TAVR, or Transcatheter Aortic Valve Replacement, is quickly becoming the new gold-standard for treating people suffering from aortic valve disease. TAVR is a less-invasive procedure for fixing stiff, damaged aortic valves (a condition known as aortic stenosis) than traditional valve surgery, which involves opening the chest bone to give surgeons access to the heart. In the TAVR procedure, doctors get to the aortic valve through by using very small incisions to pass a thin tube called a catheter through the blood stream. The catheter can then be used as a guide to send a replacement valve up to the heart, where it can take over for the damaged, old valve. While it’s been around for years, TAVR was initially used as a last-chance option for people with highly severe aortic disease who wouldn’t be healthy enough to endure the intensity of a traditional surgery. Gradually, as data started to come in from these early trials, TAVR was given as an option for people with slightly less surgical risk. Each time its use was expanded, the data showed it to be a safe alternative to traditional surgery. Now, TAVR is one of the best-studied procedures in heart care, with some of the highest-quality evidence available to show that it works for high, medium and low-risk cases of aortic disease. The latest good news comes from the results of the recently-released PARTNER 3 study published by the New England Journal of Medicine. The research, co-authored by cardiac surgeon Craig R. Smith, MD, of Columbia University Irving Medical Center, was released at the 2019 American College of Cardiology Annual Meeting. Researchers investigated the outcomes of 1,000 patients across 71 hospitals – half of which underwent traditional open-heart surgery and the other half TAVR for 1 year. Researchers found that people in the TAVR group had significantly lower rates of death, stroke, or re-hospitalization after 1 year (8.5% vs. 15.1% for open-heart surgery). 30 days after surgery, those who underwent a TAVR procedure had lower rates of death or stroke and new-onset atrial fibrillation compared to open-heart surgery. There are limitations to the study, however, as the authors point out – their analysis looks at 30 days and 1 year after surgery, which does not address the problem of long-term heart valve deterioration. Future studies will need to address long-term outcomes, added the investigators. Dr. Smith adds an important caveat, noting that “the trial also demonstrates that the displaced gold standard (surgery) also has outstanding results, which is good news for those patients whose aortic valve disease is not yet ideally suited for TAVR.” He advises that referring doctors should keep this in mind when dealing with patients for whom TAVR is still not the best choice, like those with multi-valve issues, complex coronary artery disease, bicuspid valve disease, and other complex problems. "The results presented [in PARTNER 3] should not be used to make patients in those categories feel disadvantaged because they 'must have' surgery." While more outcome and long-term historical data is needed among these patients, the results of this study are the first of its kind. Here at Columbia, we’re proud to be pioneers in the development of this life-saving procedure. Our team was at the forefront of the initial trials showing TAVR’s effectiveness, and we’ve been leading multi-institution studies on its use ever since. Our clinicians have used this expertise to teach and train physicians around the country in best practices for TAVR, so that even more patients with aortic disease can benefit from these advances. If you’re dealing with aortic valve disease, our team is here to help you understand all your options. Learn more about heart care at Columbia, or visit our Structural Heart & Valve Center for more valve information from our cardiac surgeons and their cardiology colleagues. Sign up for our mailing list for more health news and information from Columbia.